Hi ... hope someone can shine a little light on the above silver antique bracelet/bangle. Don't know if you will be able to pick up from the photo but using a loupe the first 4 letters are LAZG ... the last or 7th letter is O ... can't quite make out the two letters in between ie 5th and 6th letters. There is a 900 stamped underneath which I am presuming is the sterling quality hallmark. Apart from the hallmarks ... any idea of the origin ... looks oriental ... Indian perhaps? Re: Strange hallmark - Oriental perhaps? 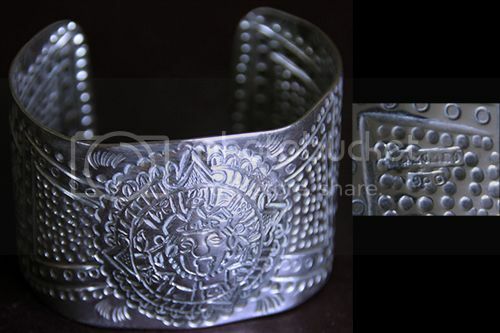 The design is based on the Mayan Calendar and is design often seen in Mexican and Peruvian silver. This piece looks contemporary but I can't make out the hallmarks and am guessing based on the flat, embossed style and what I can see of the lettering font. I can't tell for sure where it's made but would guess Peru from seeing other like pieces. Fun bracelet!